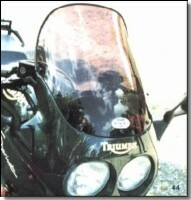 Our first product for the new range of Triumphs was the cockpit fairing. 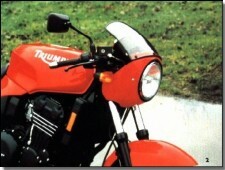 It's success made us decide that Triumph accessories were our future. 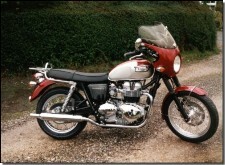 With our product range for European machines since 1978, it was a natural progression, even more so as we have been manufacturing the Avon fairimgs for classic bikes including classic Triumphs. 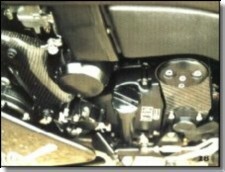 The reason for the cockpit fairing today is the same as it was in 1991, removal of the body wind blast, giving you the opportunity to cruise at much higher speeds or stay at the same speed for longer distances with less fatigue. 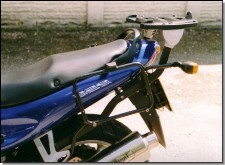 The cockpit fairing is a quality product, available colour matched for all Trident models and comes as standard with dash panel and lightly tinted screen. 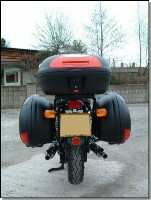 LM1 Style fairing to fit Speed Triple. 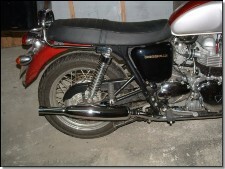 Besides complete fairings, we also offer lower panels to suit the standard Triumph sprint model. 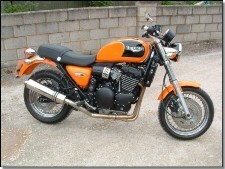 Colour matched as usual, they blend well with the rest of the bike. 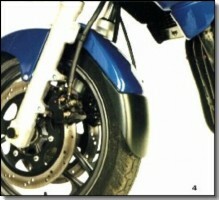 Our most popular products are mudguards. 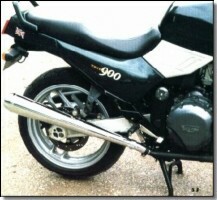 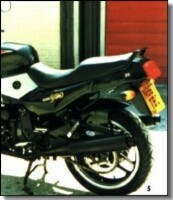 We supply longer versions of the Triumph front mudguards as well as black plastic front and rear mudguard extenders. 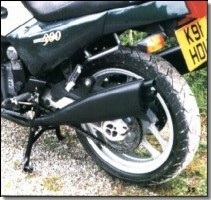 New to our product range is the black nose to fit over stone chipped 595 fairing lower sections. 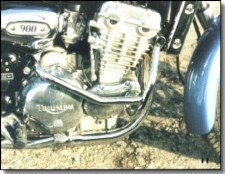 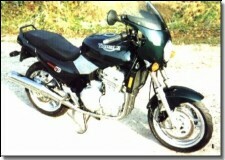 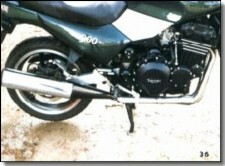 Triumph, in their wisdom, supply as standard a very stylish but rather short front mudguards. 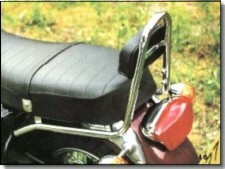 We have addressed this problem, with several choices. 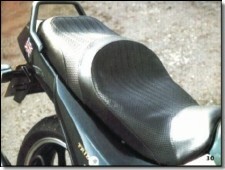 The add on black plastice 'Fenda Exetenda', colour matched original style front guard or full length hugger front guard are all a fraction of the cost of a radiator continually blasted by stones from the front wheel. 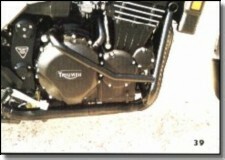 The real bonus though is that the whole bike stays much cleaner. 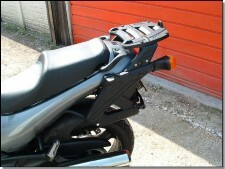 Carbon fibre versions of the hugger front guard are available in short or full length versions. 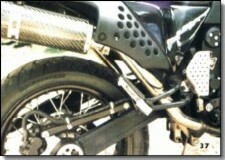 Our carbon fibre product range is increasing all the time, now includes rear hugger/chainguard (this also looks good as colour matched glass fibre product), Supper III style replica front guard, radiator covers and exhaust cans. 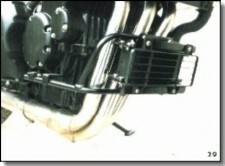 Building up a range of quality affordable accessories tailor made for your Thunderbird is easy at Sprint Manufacturing. 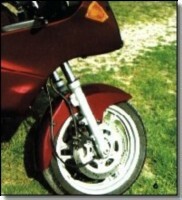 The long valenced front guard/fender, besides looking good in its colour matched and lacquered finish, offers excellent protection from stone chip damage and general road grime - your bike really does stay much cleaner! 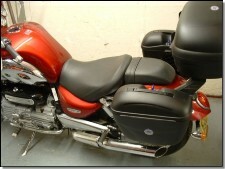 For extra comfort try our seats, screen kits and listen out for our off-road chrome exhausts. 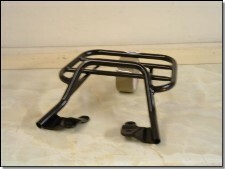 Other accessories include chrome engine protector bars, chrome racks with and without grabrails as well as just grabrails. 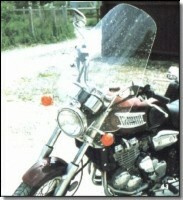 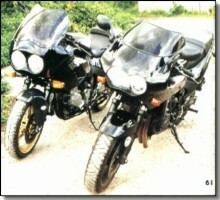 The Sprint style single and twin headlight sports half fairings share the same basic shape, the single using the existing headlight from the bike, while the twin comes complete with Cibie (120W high/110W low total output) halogen lights pre-wired with built-in relays and easily fitted auxiliary wiring loom. 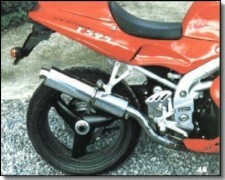 These fairings were designed specifically for the Tridents, are now also available for four cylinder Trophy 4 models and Speed Triples if the clip-on handlebars are fitted above the fork top yoke (triple clamp). 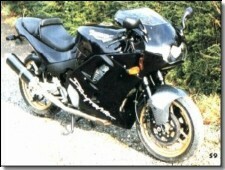 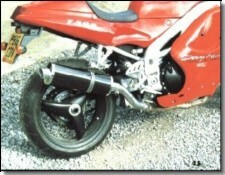 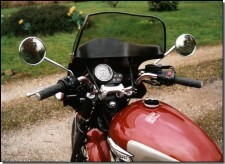 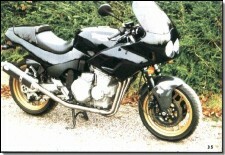 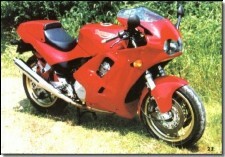 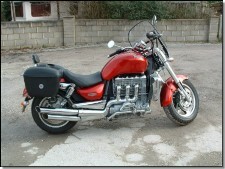 Desinged for standard mirrors, fairing mirrors can be fitted, as well as engine protector bars. 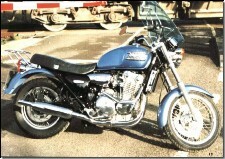 Would you like to make your Triumph look like it's travelling at 150mph while standing still? 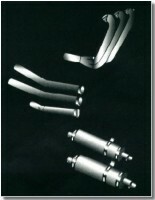 At Sprint Manufacturing, we have some products to do just that. 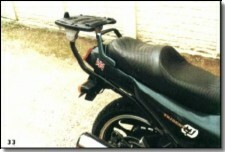 The top half fairing designed for the Speed Triple can be fitted to most Triumph models if clip-on handlebars (standard on Daytona and Speed Triple models) are fitted. 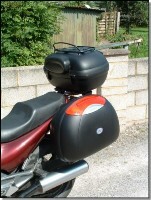 As with all our fairings, it is supplied fully finished with twin Cibie halogen headlamps mounted behind a fox eye style clear acrylic panel. 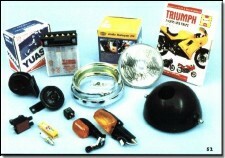 Total headlamp output, high beam 120W, low beam 110W. 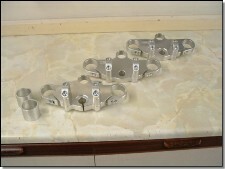 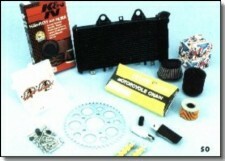 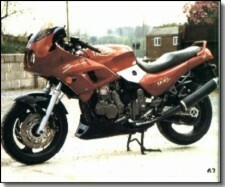 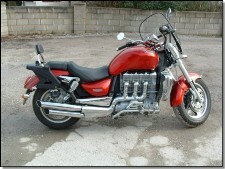 Also supplied with the fairing kit is an auxiliary wiring loom with relays for high and low beams. 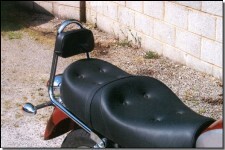 If you have a daytona, we have a fox eye top fairing which fits stright onto the standard Triumph fairing lowers to give an updated appearence to your bike. 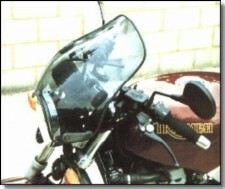 It is supplied fully finished, colour matched, with screen and carbon fibre inner panels. 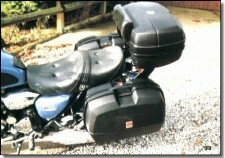 We offer a large range of Givi and kappa quickly detachable luggage systems with tailor made brackets (no universal kits) to fit each model. 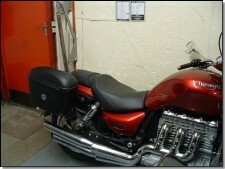 See our price list for model range availability. 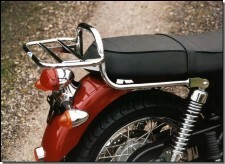 Engine protector bars to fit many models including the Tiger, racks available in chrome or black powder coating, replacement and higher screens for many models, as well as the Kappa screen to fit Tridents. 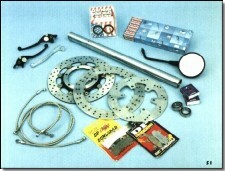 We offer a wide range of service items and replacement parts, especially those parts vulnerable to accident damage. 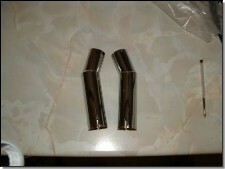 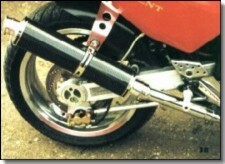 Replacement BS Au approved road legal silencers are available in bright chrome. 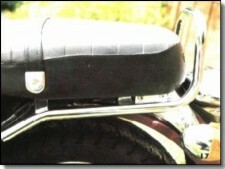 The Ray Gun silencers shown are only available for off-road use and are available in bright chrome.